An excellent mid range option with premium features. 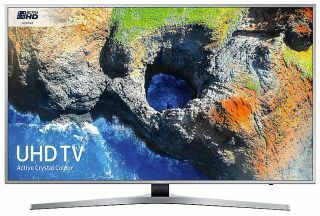 Retailing at £450, the Samsung UE55MU6400 offers last years flagship features at an excellent value mid range price point. The 49 inch display provides excellent definition and colour contrast supporting both HDR 10 and Samsung's proprietary Active Crystal Colour technology. All your favourite streaming apps are supported with the Smart Hub interface and the TV boasts a generous number of input options at this price point. A nice bonus is the central Y-Shaped stand, which allows the TV to utilise less floor space than corner mounted stands.